The Brie, the Bullet and the Black Cat - �.99 delivered. October 1942. You have been invited for dinner at the Official Residence of the Deputy Mayor of Casablanca. Morocco is a colony of France governed by the Vichy French regime. The guest of honour was to have been France's greatest living mime artist. He fails to arrive, he has been murdered. OTTO VON PINKELWURST - a Gestapo officer, fanatical and possibly mad. Everyone's a suspect when murder is on the menu. 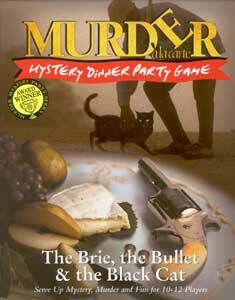 And with Murder a la Carte you have everything you need to serve up the perfect murder dinner party. First the invites, you choose which of your friends play which devious suspect and invite them to come along as that character. Then the shopping list, menu suggestions and recipes. Plus of course...a really tasty murder to solve. It will be drop dead fun, and by the end of the evening, one (or more) of the suspects, your 'friends', will be caught out as the murderer! A MURDER A LA CARTE MURDER MYSTERY DINNER PARTY FROM PAUL LAMOND GAMES.